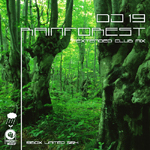 “Rainforest” is taken from DJ 19's long awaited debut album, "Phuturefunk". It’s a cover version of DJ 19’s namesake artist, Paul Hardcastle. Herein, we have DJ 19’s revised version. The original electro feel is there, but modern house beats and other elements have been added. For the single, DJ 19 has re-arranged the album version to have a devastating effect on the dance floor. The result is an impressive reproduction that both updates and retains the integrity of the original.